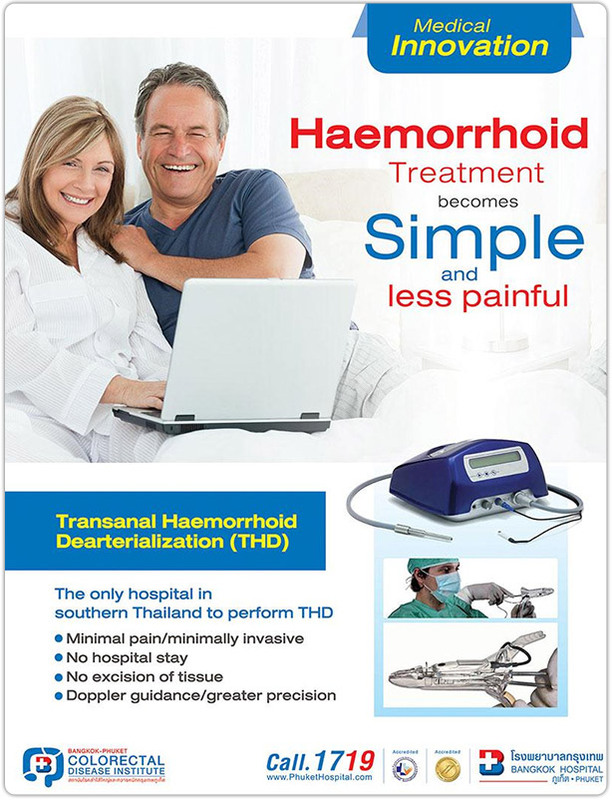 Bangkok-Phuket Colorectal Disease Institute provides minimally invasive surgery to treat hemorrhoids called transanal hemorrhoidal dearterialization (THD). THD is a surgical procedure for the treatment of internal hemorrhoids. THD uses a specially developed anoscope combined with a Doppler transducer to identify the hemorrhoidal arteries (originating from the superior rectal artery) 2-3 cm above the dentate line. Once the superior rectal arteries are isolated with the doppler, a suture ligation is performed to effectively decrease the blood flow to the hemorrhoidal plexus. In case of redundant prolapse, the prolapsed mucosal membrane is lifted and sutured (with the last suture minimum 5 mm above the dentate line), repositioning hemorrhoidal cushions in situ. This is different from a traditional hemorrhoidectomy, which focused on excising the hemorrhoidal bundle. In this procedure there is no tissue that is excised. Because the suture line is above the dentate line, post-operative pain is minimized for patients. THD can be performed with general anesthesia (going to sleep). This information should not be used as a substitute to consultation from a physician. Always talk with your doctor about diagnosis and treatment information. The service center is Bangkok-Phuket Colorectal Disease Institute of Bangkok Hospital Phuket.